Romantic relationships are always an experiment in chemistry. Just like elements in the periodic table, personalities combine and react in predictable ways. 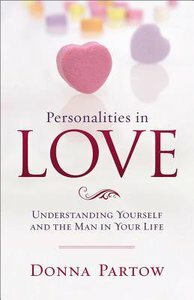 In her candid style, bestselling author Donna Partow helps women identify their own personality type and that of their man in order to bring harmony to their relationship. She gives a woman concrete advice on how to make the most of her personality, how to complement her significant other, and how to avoid potential sources of conflict. Anyone who has ever asked with exasperation "Why are we so different?" will benefit from this interesting and insightful look at what makes couples click. Donna Partow is a bestselling author, Christian communicator, and a popular guest on more than two hundred radio and TV shows, including Focus on the Family. Her books include Becoming a Vessel God Can Use, This Isn't the Life I Signed Up For, and A Woman's Guide to Personality Types. She and her family live in Arizona.